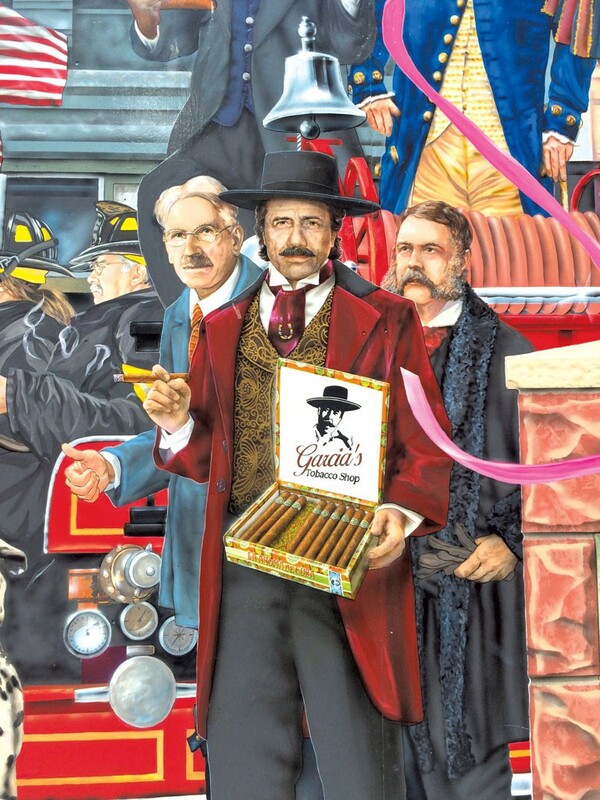 Why Is Edward James Olmos on a Mural of Vermont History? Actor Edward James Olmos' earliest Internet Movie Database billing is "Junkie in Bathroom (uncredited)" in the 1974 blaxploitation film Bogard. From this modest appearance, he went on to increasingly larger roles, including an Academy Award-nominated performance in 1988's Stand and Deliver. Some may remember his memorable turn in Blade Runner, his run on the reimagined "Battlestar Galactica" or his character Lt. Martin Castillo in the 1980s TV show "Miami Vice." Born and raised in Los Angeles, Olmos has had a career that in many ways is defined by his Mexican heritage. The struggles of being poor and brown are also reflected in his 1992 directorial debut, American Me, a crime drama about gang life in LA. Olmos strongly identifies as an activist: An entire section of his website is dedicated to advocacy for such efforts as the gang rehabilitation project Homeboy Industries. All this seems a far cry from the Green Mountain State. So what is an apparent likeness of Olmos doing on a mural celebrating Vermont history? "Everyone Loves a Parade" is the title of the mural created by Canadian artist Pierre Hardy and located in Leahy Way, aka the alleyway that connects Burlington's Church Street to the parking garage. It features a glossy, jubilant procession of past and present historical figures, from 17th-century explorer Samuel de Champlain to rocker Grace Potter to Burlington's beloved "Hot Dog Lady," Lois Bodoky. Near the beginning of the parade, flanked by Burlington-born intellectual John Dewey and 21st American president Chester A. Arthur, is the Edward James Olmos doppelgänger. Looking dapper, he proffers cigars from a box bearing the Garcia's Tobacco Shop logo. WTF? Current Garcia's owner Fred Palatino purchased the shop from founding owner Arnold Marek in the 1980s, when it was inside what is now called the Burlington Town Center. The logo represented Garcia as a mustachioed man with a broad-brimmed hat, holding a cigar — and looking eerily like Olmos. A small blurb on Garcia's website asks, "Who is Mr. Garcia?" and answers, "Mr. Garcia, the famous face of the tobacco shop, is a lover of fine tobacco and a true cigar aficionado." Except, as Palatino confirmed by phone, "There never was a Mr. Garcia. The Garcia guy was just a concept that the original owner came up with." Marek could not be reached for comment. Colchester branding professional David Smith recalled by phone that, in the '80s, his late wife did calligraphy for the Garcia's logo. At that point, he said, the mysterious likeness of Olmos was already in place. In 2007, Palatino moved the store to its current Church Street location, where it endures as a Marketplace staple, catering to locals, tourists and the odd artist who needs a cigar box or seven. One block north, "Everyone Loves a Parade" has been in perpetual procession since its completion in 2012. The mural project was commissioned in 2009 by the Church Street Marketplace Commission and spearheaded by Robert Fuller, then owner of Leunig's Bistro & Café. It was intended to commemorate the quadricentennial of Champlain's "discovery" of the lake. The unveiling coincided with the 30th anniversary of the Church Street Marketplace itself. A committee selected Hardy from 15 finalists in 2009. The 124-foot-by-16-foot painting came with a price tag of $100,000. That sum was raised with the help of local business owners, whom the city's Church Street Marketplace Department invited to become sponsors. The group worked with individual contributors and Hardy to fashion their businesses' presence within the mural, with a larger donation resulting in "more real estate" (such as a full storefront), according to executive director Ron Redmond. Palatino opted for a character holding a Garcia's cigar box. To execute this image, however, Hardy needed a model. Since Palatino declined to be immortalized as the face of the shop, the artist turned to its logo. "People have always said our logo looks like Edward James Olmos," assistant manager Jasmine Beaudette commented during a recent visit to the shop. "[Hardy] pointed that out, as well. He just ran with it, I guess." Palatino confirmed, "Hardy was the one who came up with the Edward James Olmos idea. I said, 'Sure.'" Hardy could not be reached for comment. And that was that. Through the serendipity of an invented ethnic proprietor, a well-known Chicano actor and a sponsored public art project, Olmos has weirdly found a permanent home in Burlington. And, by extension, in Vermont history. The original print version of this article was headlined "Why Is a Hollywood Actor Representing Garcia's Tobacco Shop?"